Plenty of things to do when staying at Cartole Cottages. It is possible to reach most parts of Cornwall within one to two hours but why not leave the car behind and take the train from the mainline station at Liskeard. There are always plenty of things to do and enjoy including walking, cycling, horse riding, kayaking, swimming or simply taking in the culture. Much of Cornwall’s history lies in fishing and there are plenty of quaint fishing villages to visit, traditional fishermen’s cottages, which tumble down the narrow streets to the sea, evoking a sense of times gone by. 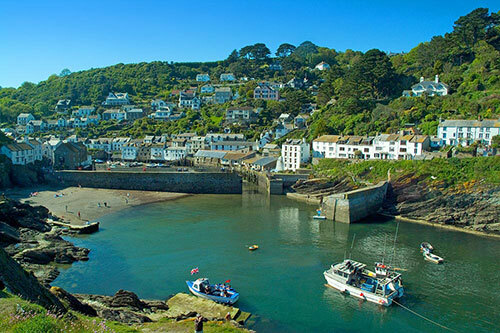 Looe, Cornwall’s second largest fishing port and Polperro, a picture postcard fishing village can both be found a mere ten minute car journey away from Cartole. Equally, Polruan, famous for it’s ship building heritage and Fowey, with its natural harbour, unspoilt narrow streets and quality shops and galleries are both easily accessible from the Cottages and both have plenty to offer visitors. Mining also played a major role in Cornwall’s past. Dotted around the county you will see remnants of Cornwall’s mining heritage. Roads and railways have all been developed to support a region shaped by mining. For those who prefer the atmosphere of a city where better than Truro, Cornwall’s capital, with it’s cobbled streets and eclectic mix of art galleries, restaurants, bars, cinema, the Hall for Cornwall and many diverse shops. Truro’s Cathedral, the Mother Church of Cornwall, who’s foundations were laid in 1880 is built mainly of Cornish granite but also features carvings in the softer Bath stone and is a major tourist attraction. Being Cornwall’s second largest fishing port means that there is always an abundance of freshly caught fish on the menus of the many quality restaurants in the town. Enjoy the sandy beach or wander the narrow streets. Take a boat trip to Looe Island or find out what lies beneath the ocean waves in the glass bottom boat trip. Why not book a trip on one of the many fishing boats for any thing from a couple of hours to a full days fishing. A picture postcard fishing village, with its picturesque harbour, narrow streets and jumble of cottages. Take a boat trip along the coast to give you a totally different perspective. There are a good selection of Pubs, many with live music, good food and a lively atmosphere. Polperro is one of those little gems, which gives the illusion of being un-spoilt by time. Famous for it’s ship building heritage. A quaint little village with narrow streets and linked to Fowey by a passenger ferry which makes frequent trips across the estuary. Fabulous views of Fowey from the top of the village. Fowey has plenty to offer, with its natural harbour, unspoilt narrow streets and quality shops and galleries. The Fowey festival of words and music is held each May, originally launched as the Daphne du Maurier Festival of Arts and Literature. There are many good pubs and restaurants in the town, with ferry links to Bodinnick and Polruan. Cornwall is surrounded by coastline so as you would expect there are numerous beaches and stretches of coastline to visit, close to Cartole Cottages you will find a variety of different beaches suited to all your holidaying needs, whether it’s sunbathing on Lantic Bay, South East Cornwall’s best kept secret or rock pooling at Hannafore Beach, watching the Wrass and Pollack whilst Snorkelling at Talland Bay or even at our local beach in Looe, where there truly is something for all the family, you are assured of finding a beach for you. 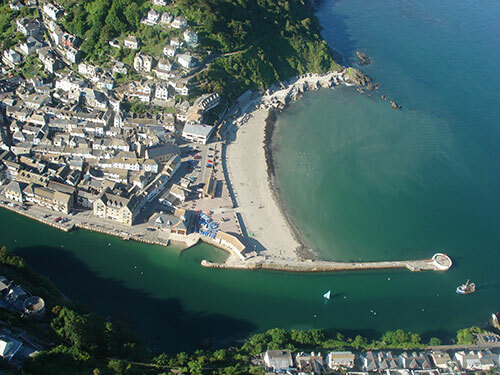 The beach in East Looe sits directly in front of the old town, sheltered from the west by the famous Banjo Pier and overlooked from the east by the hillside of Mount Ararat. East Looe beach is a good family beach that has something for everyone. At low tide there is a large gently sloping sandy beach which is generally safe for swimming, although it is not recommended to swim by the river mouth beyond the pier. The rock / sand beach here is a great spot to get away from the crowds and good for snorkelling. Hannafore Beach stretches from Hannafore Point along Marine Drive and actually consists of two beaches, Hannafore Beach & Wallace Beach. It is predominantly a rocky beach with shingle and some patches of course sand at low tide. The beach is probably best known and best enjoyed for its fantastic rockpools that are uncovered twice daily as the tide retreats and for its view across to St George’s Island, now more commonly known as Looe Island. With a south east facing perspective, the beach is a suntrap for those who prefer a less populated beach than the sandy beach across the Looe River mouth. Here you will also find tennis courts, pitch and putt and Looe Bowls Club. Talland Bay has two sheltered shingle beaches, Talland Sand and Rotterdam Beach, and some large rocks to the side which make for a comfortable place to sunbathe. At low tide there is some sand and plenty of rock pools to explore. Talland is also a must for the snorkeller with the regular Pollack and colourful Wrass to the occasional flash of the silver Bass. Talland is a good beach for catching edible crabs – if they have not crawled into the pots that are dotted a short distance out to sea by the local crab and lobster fishing. Stunning views of the bay from the cliff path above. South East Cornwall’s best kept secret, Lantic Bay is a quiet sheltered cove with white sands, feeling more like the Mediterranean, than Cornwall. An excellent beach, but it can be difficult to find. Bathing can be hazardous and toilets are some distance away. Dogs allowed all year. The bay is a beautiful, sheltered, south facing bay that can only be accessed on foot or by boat. Park in the National Trust car park and cross the fields to reach the path down to the bay. Don’t forget your sandwiches as it’s a long climb back to the top. Lansallos Beach is a small sheltered sand & shingle beach reached by a half mile walk from the Lansallos car park in Lansallos village. The beach is not well known so it doesn’t get too crowded. No toilets or facilities. Dogs allowed all year. Readymoney Cove is a south-east facing sandy beach to the south of the harbour town of Fowey. A sheltered harbour beach in the small village of Polkerris, overlooking St Austell Bay. Large shingle beach, south facing. Located at the entrance of the River Seaton valley. Ideal for sailing (with slipway), surfing and shore fishing. Portwrinkle, near Looe on the south coast of Cornwall has two sand and shingle beaches with numerous rock pools and a small harbour. Buffered by warm Gulf Stream air, Cornwall’s growing season begins much earlier than in other parts of the UK, this is why you will find so many beautiful gardens in Cornwall. 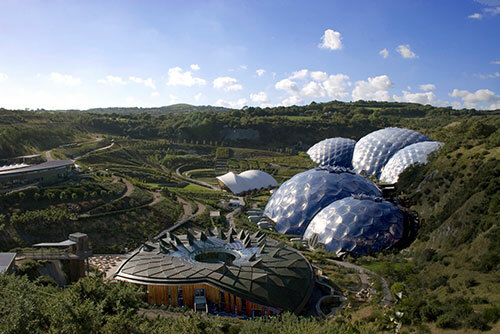 Eden’s biomes house examples of habitats from around the world and plants you thought never to see in Cornwall, such as coffee, bananas and mahogany. 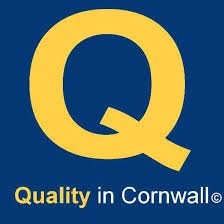 Located near St Austell it is only a short drive away. To see one of the most popular botanical gardens in the UK you need go no further than Mevagissey, a 50 minute drive from Cartole Cottages. Heligan was created by the Tremain family, who started the work in the 18th Century and continued right up until the 20th Century. They were neglected after the first world war, but have now been restored to something like their former glory. The gardens are now happy to accept dogs all year round. This remarkable garden has over six thousand labeled plants for you to enjoy. Trewithen Gardens – This privately owned garden with wonderful woodland walks and 18 Century house is internationally renowned for its collection of magnolias and camellias. 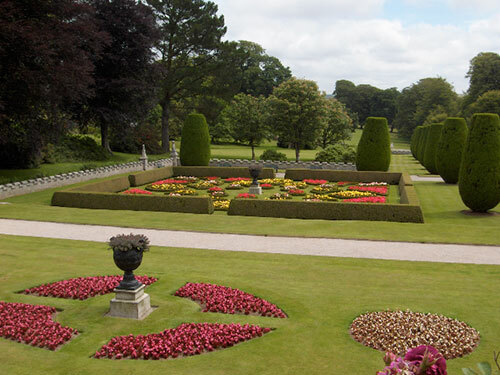 Lanhydrock House and Gardens – famed for their camellias, magnolias and azaleas. Cotehele, a house is filled with medieval armour, tapestries, textiles, oak furniture and pewter and formally planted terraces and a Valley Garden boasting a medieval stewpond and dovecote. Antony House, used as the film set for Tim Burton’s Alice in Wonderland, with grounds, which border the Lynher Estuary contain modern sculptures as well as the National Collection of Daylilies. Pencarrow House and Gardens – a mixture of formal landscaping and woodland walks. The largely Georgian house has a fine collection of paintings, beautiful china and porcelain. Cornwall is full of places to take the children to give them a great day out. Whether they are toddlers or teenagers there is something for them all and in many cases mum and dad can join in as well. Be it thrill rides, water activities, adventure parks, indoors or outdoors, its all here. Crealy Great Adventure Park – A fun day out for all the family with theme rides, animals and character events. Indoor and outdoor fun, with a special area for pre school children. An award winning play centre, for the whole family. The majority of the centre is undercover so that you can enjoy the fun whatever the weather. The park includes soft play, dodgems, climbing wall, skytrail, treehouse etc. All the activities are included in the admission price and you can stay all day. Active 8 offer family activities in Cornwall, from Kayaking and canoeing, horse riding, zip wire, surfing, wake boarding to lazer tag and paintball and much more. Active 8 Cornwall Ltd can book these activities for you and all at the lowest available prices. Located less than half an hour away, the zip wire is the largest in the UK. Hurling you over a flooded quarry at speeds that will get your heart pumping. It is suitable for everyone, whatever their age. Kart World provides a great day out for the budding racing driver. From the 5mph kart for small children to full size adult carts, it’s all here. Located approximately half an hour from Cartole Cottages. 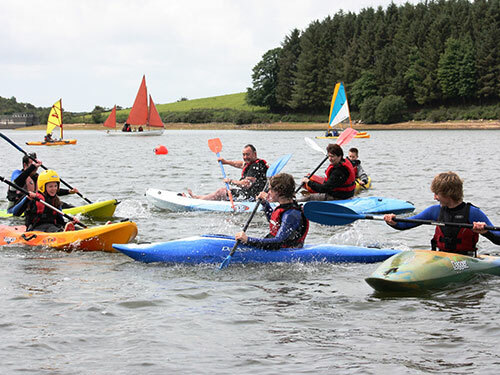 Siblyback Lake on the edge of Bodmin Moor offers activities such as windsurfing, sailing, kayaking, wakeboarding, cycling and much more. Wakeboarding is one of the fastest growing sports in the UK and this is the first full cable system in Cornwall. Cornwall’s roads are usually quieter than many other parts of the country and offer a great opportunity to dust off that bike and take to the open air. If you don’t like riding or walking on roads then there are some great places off road to explore. You can also bring your own bike along if you prefer as we can provide undercover storage for it while you are on holiday. The 3.5 mile cycle path around the Siblyback Lake provides opportunity for adults and children. Cycle hire is available along with child trailers and child seats. There is also a café on site. Owned by the Forestry Commission, the woods provide varying terrains for riders of all abilities. Set in the Cardinham Water river valley, the woods are popular with cyclists and walkers alike and are a favorite area for barbeques and picnics. 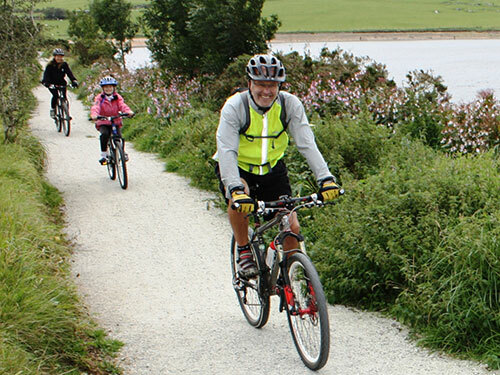 The Camel Trail which runs from Bodmin to Padstow, is one of the most well know recreational routes in the country. The South West Coastal Path is famous for it’s beautiful scenery and is one of the top walks to be found anywhere in the world. It can be accessed only a short distance from our cottages. The coast path offers anything from a short afternoon stroll to the challenge of hiking the entire route or something in between. You can find out more about walks in the Looe area here. Whether you are hooked on rock fishing, beach fishing, river and game fishing, coarse water fishing or lake fishing Cornwall has it all. Within a short distance of Cartole Cottages you will find all these options available to you. Please see below some suggestions for fishing in the local area. Take one of the many trips on offer from the quay in Looe and enjoy anything from 2 hours to a full days deep sea fishing. You can also fish from the beaches and rocks along the coast, particularly Whitsand Bay, Seaton and Downderry. Gorran Haven, Rame Head and Queener Point in Whitsand Bay are all popular for rock fishing. For lake fishing we have Bake Lakes, a short distance from Looe. The fishing lakes have seven separate lakes in a fifteen acre site and are richly stocked with rainbow and brown trout, rudd, roach, tench etc. 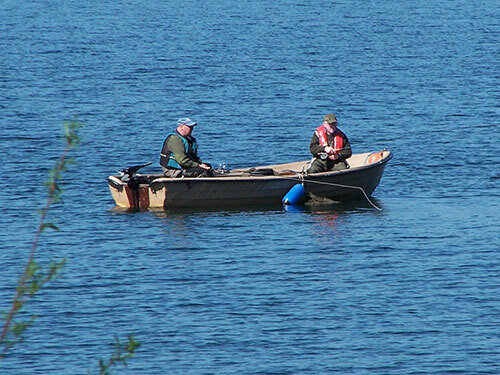 There is also Colliford Lake for traditional fly-fishing for brown trout and Siblyback Lake for rainbow trout. What could be better than experiencing Cornwall from the back of a horse? Horse riding makes you feel part of your surroundings and gets you in touch with nature. Just along the road is Polmartin riding stables. Here you can ride through wonderful countryside guided by experienced handlers. They also offer lessons to the inexperienced rider. Set in around 60 acres of Cornish countryside, riding includes hill tracks, woodland, field and lakeside as well as cross country jumps without ever leaving the farm. Talons, offers hands on owl experiences and farm tours, where you can really get up close and personal with all the animals and birds. 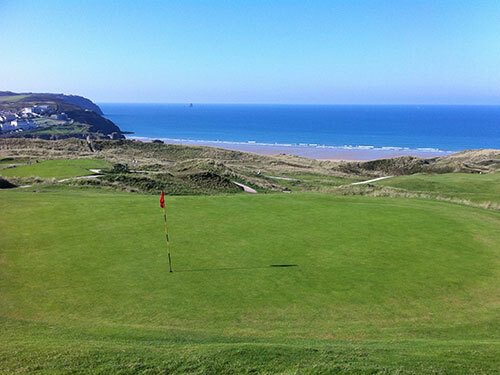 Golfers are spoilt for choice in Cornwall with dozens of golf courses to choose from, whether you are a novice or a pro. Choose from either a coastal or an inland location, there are plenty of each. Our local golf club is Looe Golf Club, located a 20 minute drive from Cartole Cottages, in a beautiful area on the outskirts of Looe with panoramic views all around from Dartmoor to the Tamar estuary and Looe island. Looe Golf ClubLooe Golf Club is located in a beautiful area on the outskirts of Looe with panoramic views all around from Dartmoor to the Tamar estuary and Looe island. The course was designed by six times champion Harry Vardon and provides an excellent test for golfers of all abilities. Looe golf club is said to be one of the friendliest clubs in the South West. Lanhydrock Golf ClubAn 18 hole golf course in a sheltered wooded valley near Bodmin, said to be one of the finest in the South West and offering a challenge to all golfers what ever their ability. LostwithielEstablished in 1991 this par 72 golf course is set amongst 150 acres of rolling wooded hills in the river Fowey valley close to Bodmin. St Mellion InternationalWith its Jack Nicklaus signature course as well as the Kernow course, St Mellion is known the world over as one of ‘the’ places to play. St mellion also has a short, 5 hole, par 3 course which opened in 2013 and is great for a family day out and gives youngsters a chance to try golf for the first time.